Seventeen-year-old Rachel Hill is the girl most likely to succeed. And the girl most likely to have everything under control . . . that is, until her dad invites Nick McGowan, the cutest boy at school, to live with them. Rachel worries that this could only be a recipe for disaster, but her best friend Zoe thinks it’s the perfect opportunity for lurve. Sparks start to fly for all the wrong reasons. Nick finds Rachel spoiled and uptight and Rachel dismisses Nick as lazy and directionless. But a secret from Nick’s past draws them together and makes the year Nick McGowan came to stay one that Rachel will never forget. I hadn't heard of this novel until I came across Mandee's review of it on Vegan YA Nerds or Maggie's review of it on YA Anonymous, but I knew upon reading both their gushing reviews that I had to get my hands on this one. Luckily enough for me, The Year Nick McGowan Came to Stay was readily available in the US and I was thrilled beyond measure to be diving into this short, but witty tale. Ultimately though, while this novel was definitely satisfying, it wasn't satisfying enough. Rachel, our protagonist, is a cute, laugh-out-loud funny, and all-round adorable character. Her flaws are obvious, her childish behavior endearing, and her friendship with her best friend Zoe oh-so-amusing, not to mention the riot that her relationship with her parents is. When Nick moves in, Rachel and Nick don't quite get along, but as the novel progresses, you can see them develop a close bond of friendship. I'm not denying the refreshing nature or pure enjoyability of this short story, but it was somehow disappointing as I wanted more. more character development, more growth, more depth. The Year Nick McGowan Came to Stay tackles some heavy topics, but it really could have been better novel if Sparrow had chosen to extend it, even by another hundred pages. Nevertheless, if you're looking for something short, sweet, and sure to bring a smile on your face, you simply can't go wrong with this story! Alona Dare has been living as Lily “Ally” Turner for over a month...and it's not been easy. Besides being trapped in a body so not as good as her original one, she's failing miserably at playing the sister and daughter of people she barely knows. Plus, she can't help but think that Will Killian - the boy she hates to care about - somehow wishes the real Lily were back. She and Will have been trying to find a solution, looking for a two-for-one miracle that would free Alona and keep Lily alive. Visits to local psychics have proven useless, but then they stumble across Malachi the Magnificent, who seems to be different. His office is full of ghosts, for one thing. But Malachi doesn’t seem to hear or see them, which is odd. Plus, he bolts the moment he sees Will. To make things even weirder, Misty Evans, Alona's former best friend, is waiting in Malachi's lobby and claiming that she's being haunted. By Alona. Will's convinced that Malachi has answers, while Alona is all kinds of pissed that someone's impersonating her. But their efforts to uncover the truth will bring them much unwanted attention and put them directly in the path of a ghost who will stop at nothing for another stab at life. Even if it means destroying Alona. I am both simultaneously deliriously happy by the ending of this novel and sad that this trilogy is truly over. When I first picked up The Ghost and the Goth by Stacey Kade, I expected a cute, fun, and mindless read – I was right, but only in part. The Ghost and the Goth surprised me by having well-rounded characters and a romance that was slow, started with friendship, and actually had me rooting for it. Body and Soul ties up the loose ends in this novel perfectly. Nevertheless, it took me awhile to warm up to this series. It’s one of those trilogies where you have to let go of science and reason and simply go with the flow. It isn’t all realistic – but we’re dealing with ghosts here, so what could be? – but it does have substance to it, along with a truly remarkably written romance. Its characters, Alona Dare and Will Killian, are flawed, realistic, and intensely unlikable at times, but they grow on you and make their way into your heart. Although their romance seems typical with its flirty banter and clichéd stereotypes, it actually tackles on complex issues such as loving someone for their soul or their body or even parental issues. If there are any flaws with this series, it is that some things could have been explored in greater depth, but overall, this series always manages to put a smile on my face, so I can’t complain. You need to be in a certain mood to read The Ghost and the Goth, one where you need laughter, fun, but also a tad bit of depth thrown in. Needless to say, this is the perfect rainy-day-re-read type of novel and I’m already eagerly anticipating Kade’s next novel which will hopefully contain the same steady and developed romance, unique concept, intriguing characters, and signature wit which I’ve come to love. And now you have me wanting to read this ghosty goth series which I never would have even heard about, so thank you! I really liked the first two books in The Ghost and the Goth series. Like you, I was able to just let go and enjoy the cuteness, and I agree with you that the characters are unusually well-developed, although I can't say that I remember much of the plots, which is sort of the point, I suppose. I bought this book as soon as it came out but was reluctant to read it because I didn't want it all to end, and I was afraid it wouldn't be as good as the first two. Good to know I was wrong. I'll read it as soon as I can. Two fun books that are perfect for a stormy day like today! I only read the first in the Ghost and Goth series and found it really enjoyable but nothing special. Love how you talked about the unrealistic part of the story being bonded with it being about ghosts. Definitely wan to read the second two books now. these both sound like super cute books! 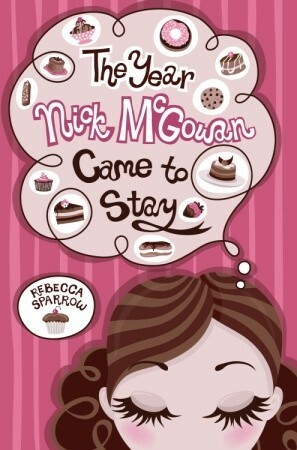 the year nick mcgowan came to stay looks up my alley, esp with the cute desserts on the front cover. i like it when you expect fluff but it's more so i'm glad the ghost and the goth series did that. I really need to read the Ghost and the Goth series, I've heard such great things! And I love that the romance is nice and slow and progresses from friendship to something more. So much better than insta love/lust:) I'm all about the characters when I'm reading, so I'm thrilled to know they're well-rounded in this book and seem to have depth and complexity. Can't wait to meet them Keertana! I've never heard of the first book but it sounds like a cute read. The girly cover w/ cupcakes and other sweets made me think that it was a MG book though! I'm still really excited to read Nick McGowan soon. Maggie sure does know how to rile readers up. She made me want to REread My Most Excellent Year yesterday and I was the one who recced it to her! :) I haven't read any of the Ghost and the Goth books. I...just...I just really hate ghost books. I don't know what it is but it's one of my least favorite things. Glad to hear the entire series is good, though! Oooooh, Keertana, Nick McGowan sounds seriously cute, but... I'm kind of intrigued that the MC is 17 -- older end of the YA scale -- and the book deals with heavy issues... But is packaged like MG or tween fic, and is so short. Hmmm. And ghost and the goth! I have bad my eye on this series for a year, but I don't think I've seen reviews before. Sounds kind of amazing and... Ok, I am DYING to know what happens, based on that blurb! Oh man, how time flies! I remember reading The Ghost and the Goth and being surprised by how much I enjoyed it too. I can't believe the trilogy is over ... and I haven't even read the sequel yet! I haven't heard about The Year Nick McGowan Came to Stay but it sounds like a fun read. I'm going to see if it's available at my library. That first book looks MG, it was surprising to see shes 17. It sounds interesting though! I will check out more reviews. I love The Ghost and the Goth! I have been wanting this third book but still haven't bought it. I need go do that soon! I still liked it, though, and gave it 3 stars. I'm glad you enjoyed it more than I did, and I am glad that it turned out to be a satisfying conclusion. I would encourage everyone to read this story. The writing is excellent with lots of beautifully written, thought provoking lines. It'll leave you more carefully observing and questioning the world around you, and the subtle changes to the law made by those in power that have a deliberately unnoticeable, yet tangible, effect on our lives.